Ned Denison described an inspirational recognition evening for Peter Bales and his Kay. "Peter has been an intrinsic part of the open water swimming experience that has given me so much joy. And I know there are many like me. He is one of the few people I know who helps others without expecting anything in return and he does so tirelessly. The countless hours he has spent on the boat in support of fulfilling the dream of young (and not so young) swimmers of all abilities, is probably only matched (or topped) by the amount of hours he has spent behind the scenes, organizing, watching the weather, doing admin, and generally taking control. And then there is of course Kay, who – let’s face it – would often be more than just one step ahead, making sure that no detail is missed and that there is at least three sandwiches for each person on the boat. 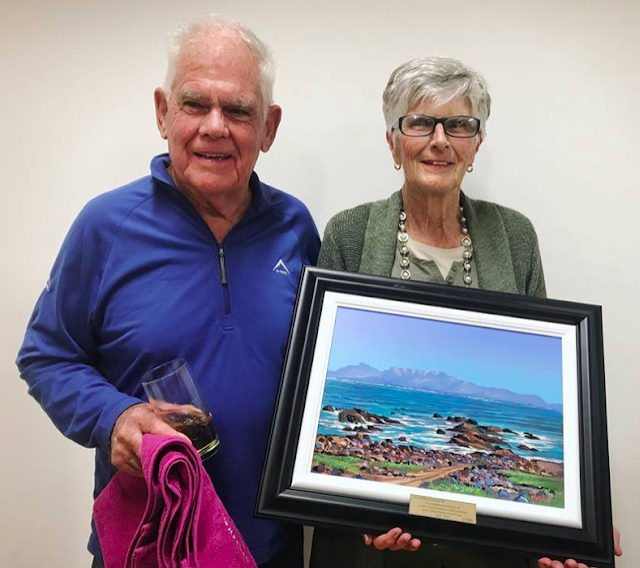 As chairman of the Cape Long Distance Swimming Association, Peter’s sole objective was to promote open water swimming in its purest form and to facilitate opportunities for any swimmer that was brave enough to want to try. Let’s not forget that Peter was a pioneering swimmer himself – bold enough to swim where no one or very few have swum before and often with very little training; setting firsts and breaking records, some of which stood for decades. I think we would all agree that Pete’s retirement signals the end of an era for open water swimming. It is a moment which had to arrive and probably did so at the right time. It is an exciting time for open water swimming as the masses discover the joys that only a bunch of us used to share, and although it is wonderful to see, it is natural to also feel a bit nostalgic. But there is something that the new wave of open water swimmers (hopefully with the exception of a few lucky ones) will only be able to dream of, and that is the caring but firm, sensible yet bold, and serious but witty contribution of the father of open water swimming in Cape Town – the iconic Peter Bales."